How many times have you needed Accompaniment or Performance Tracks but they were not available? Wouldn't it be amazing if you could make Accompaniment Tracks, Performance Tracks, Backing Tracks, and Karaoke Songs from all your favorite songs? Now you can! 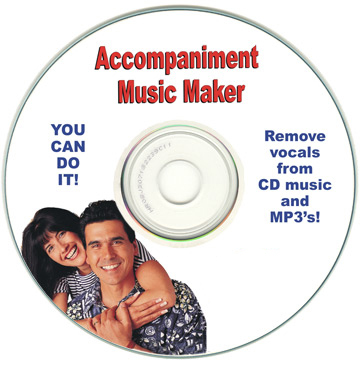 Accompaniment Music Maker Software can reduce or remove vocals from any song on your computer or from any music CD. 2. Using the Accompaniment Music Maker Software, your computer will reduce or remove vocals from the music. Using sophisticated waveform sound inversion software technology, centered vocals without echo will be stripped away, and centered vocals with echo or reverb will be reduced automatically. Any remaining vocals provide a pleasing backup vocal effect. Your original recording must be in stereo and vocals need to be in the center of the stereo track; vocals on the left and right sides are not removed. 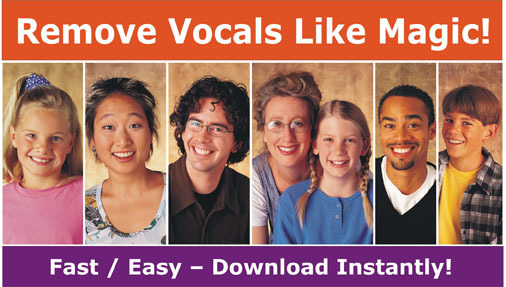 After reduction or elimination of the centered vocals, you can write the music to a new CD, and use it in any karaoke machine, stereo, or portable player. 3. Now you can be the lead singer over the new accompaniment tracks, which may already have a pleasing backup vocal effect, or you can add additional backup singers. A built-in multi-track editor allows you to change the length of the song, cut portions out of the song, and even record voice with the music. You can also keychange the pitch of the music to any key. Why waste time looking around for Accompaniment Tracks, Performance Tracks, Backing Tracks, or Karaoke CDs when you can remove vocals from any of your favorite songs? Can you imagine having all your favorite popular songs as accompaniment versions? Wouldn't it be great if you were the ONLY person with certain songs that ONLY YOU could perform? 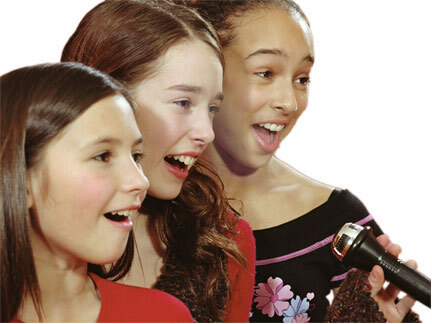 Won't your kids be surprised if you present them with their favorite songs to sing with? Remove Vocals Like Magic! Make Accompaniment Tracks from songs, CDs, MP3s.